Free Computer Virus Scan looks at some of the free tools and utilities made available on anti virus websites. After reading this page your knowledge to find and use the different types of tools available improves. Their purpose and actions vary depending on the Virus they are dealing with. Some scan your computer after you initiate the scan. Some run automatically in a command prompt. Some reboot your computer. We will look at a typical example of each so you are confident enough to use other programs if ever you are in trouble. Many virus removal tools are provided free of charge by anti-virus programmers who find virus writers morally repugnant. The Viruses these utilities are designed to remove are often beyond the capability of your anti virus program. This is part 2 of a series on how to remove computer viruses from your computer. Part 1 looks at some of the most popular and best free anti virus programs available today. A little known trade secret of the IT Industry to test your Anti-Virus program is working correctly. IT Professionals use this technique frequently, and it is very easy for you to use it too. Which free virus removal tools have you used before? What happened to your computer that made you turn to that specific tool? Write your own personal web page by completing the Which Free Tools Have You Used Before? form at the bottom of this page. You can also read other visitors stories at the bottom of this page. Rootkit.Win32.TDSS is a nasty Malware Family that allows the cyber criminal to secretly take over your computer. They have full access to do or take anything from your PC. 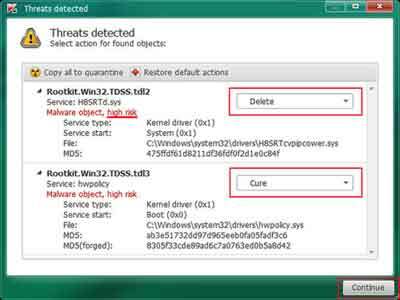 Kaspersky provide Anti-Rootkit utility TDSSKiller (Opens New Window) free of charge on their website. This Free Virus Scan utility removes all forms of this rootkit from your computer. To download and run the utility. Select the TDSSKiller link above or go to the Kaspersky website - Virus Removal Tools section. Once the utility downloaded, double click the TDSSKeller.EXE and wait for the initialisation process to complete. This is usually very quick. When the utility loads, left click the Start Scan button. The free utility will scan all of the relevant areas of your computer. If the scan finds no rootkit on your computer, you receive a message on screen telling you so. If the scan finds the rootkit on your computer, you see a screen similar to the one below. Select one of the Delete/Quarantine/Cure options for each infection. I usually go for Cure. A large number of utilities work in this way. Another example of such a utility is the McAfee Stinger. The Trojan-Spy.Win32.Zbot family logs the keys you press on your keyboard, stealing your passwords to online banking and other secrets access codes. This particular Trojan is completely silent, so you would never know of its existence until the damage is done. When you download and run this virus removal service it opens up a Command Prompt. Wait patiently for the scan process to complete. If ZBot is on your computer, this utility removes it. Trojan.Zeroaccess is a Trojan Horse that uses your computers capabilities to make money through various means such as targeted adverts. The Symantec Zero Access Fix Tool is another useful free computer virus scan tool. Expect to reboot your machine part of the removal process. To use this utility. Download and run the Symantec Zero Access Tool (Opens New Window). Select I Accept when prompted by the License Agreement. Select Proceed when prompted to start the scan. Select OK when prompted to restart your computer. When your computer restarts you are prompted to run the tool. Select the Run Button (Windows 7 and above). A Command Prompt appears and the virus is removed. If your computer does not have the Zero Access infection, you receive a message similar to the image below. The Bitdefender USB Immunizer Tool (Opens New Window) is another useful free computer virus Scan prevention utility. Viruses are initiated on USB Sticks using the autorun function. That means they load automatically when you plug your USB stick into your computer. The Conficker Worm is a notorious infection that can spread in this way. Autorun was designed to help home computer users reinstall software easily. However, cyber criminals exploit this to their advantage. This tool prevents autorun from working thereby thwarting the cyber criminals attempt to infect your machine. In late 2011, Microsoft disabled autorun on all its supported Operating Systems by issuing a Windows Update to changes your computers settings. The free computer virus scan Tool released by Bitdefender is added protection against cyber criminals. To use the utility. Select the Bitdefender USB Immunizer link above to download the program. Run the tool when prompted, then accept the license agreement. Select the OK button if prompted. Read the Computer Immunization Status. If it says "... you appear to be vulnerable to Autorun worms..." Select the ON button. The Computer Immunization Status should now read "Great, your computer is immunized". When you plug a USB stick into your PC or Laptop, Bitdefender USB Immunizer will perform an analyse scan to determine whether immunisation is required. Select the Yes, Immunize Button. A message stating "Your computer has been immunized successfully." should appear on your screen. The version of BitDefender released in 2014/15 looks different to the 2012 version above, but works much the same way. I hope the examples above help your confidence in finding and using free virus removal tools to protect your home PCs. These types of programs are essential to clean computer virus infections that are potentially difficult for your anti virus program to remove. Companies like McAfee and Kasperksy offer virus removal service utilities free of charge. The choice of utilities is constantly increasing as more vicious and persistent viruses are written by cyber criminals. I recommend you read my review of the best free anti virus software on the market today. See Free Virus Removal Software for details. Which Tools Have You Used Before? Lots of Companies provide Free Virus Removal Tools. Which ones have you used before? What happened to make you use that that specific tool? Enter Your Title e.g. "Kaspersky VirutKiller"